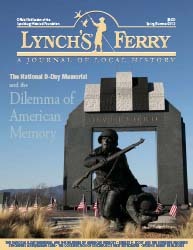 A Randolph College student’s interest in the study of public memory and memorialization, sparked during numerous trips through Moscow’s recently renovated Kurskaya metro station, eventually leads her to a museum on Main Street in Bedford, Virginia, where she surprises herself by wading into a brouhaha over a bust of Josef Stalin, a piece commissioned by the National D-Day Memorial Foundation and created by a Lynchburg College art professor. Transportation, commerce, power, recreation—the ambitious R. G. Scott took advantage of just about everything the James River & Kanawha Canal had to offer, including post-flood repair work. His knowledge of the waterway also proved valuable in speeding the advance of its rival: the Richmond and Allegheny Railroad. But even then, the entrepreneur simply incorporated rail travel into his scheme to keep rolling on the James. Eighty years and many delicious luncheons later, the Antiquarians are still going strong: exploring historic places, cataloging the region’s noteworthy craftsmen and wares, and contributing to community causes. Their momentum comes as no surprise considering the powerhouses who launched the organization, a list of ladies that includes Mrs. E. Alban Watson. The author highlights the projects early cash-strapped Antiquarians managed to undertake once they were able to get up from the table. With spring-cleaning projects looming, this informative how-to from the curator of the Lynchburg Museum System is well timed. The good news: a sturdy plastic tote and acid-free tissue paper may be enough to protect many of your treasures. The bad news: Barbie and Ken are breaking down.